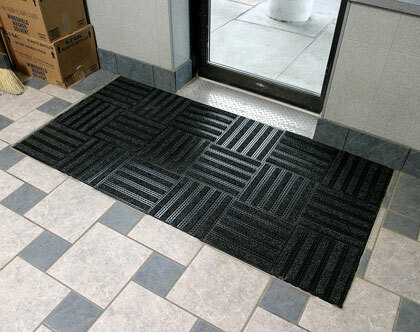 Linear Look Modular Recessed Entrance Matting Tiles are 1' x 1' x 1/2" interlocking 100% recycled tiles. The tiles are made of recycled PVC and olefin carpet. The interlocking tabs easily snap together for quick installation or replacement. These Linear Look Modular Recessed Entrance Matting tiles are part of a sustainable development program. At the end of their lifecycle, the tiles can be returned to the manufacturer for a credit toward a replacement order. Your returned tiles are then cleaned, ground up, treated for contaminants and re-formed into new tiles - all in an environmentally safe process. Call or email for additional details. Green product: Made from 100% recycled materials and 100% recyclable. As an incentive to continue keeping the materials out of landfills, we'll even buy back your old tiles to make into new ones. Please call or email for details. 1'x1' tiles to easily fit any sized area. Interlocking for easy install or replacement. 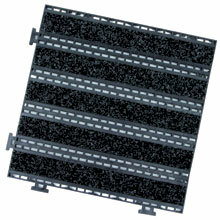 Use as recessed matting or directly on the surface with beveled edge ramps. Brushes shoes and wheels clean of dirt, slush, sand and other unwanted debris normally tracked in, to save your floors from expensive cleaning and wear. Ideal for heavy wear areas in retail and grocery shopping centers, airports, amusement parks, movie theaters, ramps, entryways, etc. Materials: Recycled PVC tiles with olefin carpet. Call us up to get the ball rolling. You will return your used tiles to us for a credit* on a future order of replacement tiles of the LinearLook Modular Entrance Matting line. The tiles you send to us are then cleaned, ground up, tested and treated for contaminants in a process also environmentally safe and then reborn into new matting. Not only did you just save all of those tiles from going to a landfill, you also helped keep the world a little greener by lowering the need for more new raw materials. 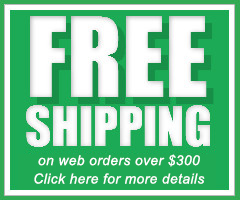 You can now use the credit* we've given you to purchase replacement matting.